A reader writes in with insights into why Russia might have provided the Ukraine rebels with BUK missile systems. In my last post, I discussed how Russia might not have been directly involved in the downing of the MH17 airliner last Thursday (although it just as easily might have been, and even if it wasn’t directly involved it still had a role by arming and supporting the rebels). In the piece, I questioned what incentive Russia would have had for giving the Ukrainian rebels BUK missile systems, instead of just using more rudimentary anti-aircraft weaponry like MANPADs. I also suggested that there were likely individuals fighting on behalf of the rebels who could operate the BUK without assistance from Russia. After early losses in their civil war to MANPADs and AAA, the Ukrainians shifted toward attacking from medium altitude (above 5,000 meters) to avoid the effective operational envelope of Russian MANPADs systems and AAA (this is common – we did the same in both Gulf Wars). It is likely these events prompted the Russians to take some sort of action to provide higher altitude SAM coverage by either deploying their own forces or providing a battery to the Donbass Cossacks [editor’s note: the separatists]. 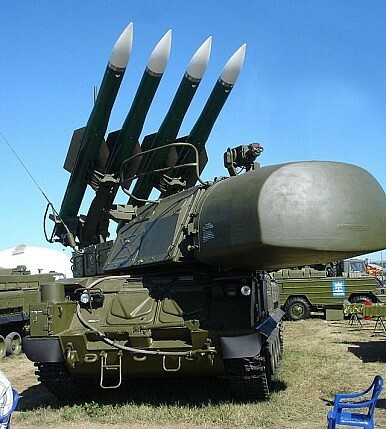 The sightings by AP reporters on July 4th of launchers resembling SA-11/17 [BUK] launchers in Donetsk seem to coincide with the uptick in SAM shoot downs the week leading up to the MH-17 tragedy. As far as who was running this battery, the SA-11/17 tree has been an integral piece in Soviet tactical doctrine for layered battlefield air defense, and was relatively ubiquitous in Russian Tank and Motor Rifle Divisions since the early 1980s. Given the length of service of the SA-11/17 platform and the former size of the Soviet army, I guarantee you there are plenty of non-Russian soldiers on both sides of this conflict that can operate the SA-11/17 in their sleep. Though the released cell phone intercepts tend to point toward Russian operators, the rebels could have done this with relative ease. Steve also asks the million dollar question: “I am still at a loss as to why the airspace above Ukraine wasn’t closed to civil aviation the moment that system was spotted in the country.” I don’t have a very good answer for that question, especially given that Ukraine shot down a civilian airliner with a BUK launcher only a few short years ago. Here’s a few thoughts, however. First, my understanding is that despite the reports of rebels acquiring Buks, the rebels hadn’t really used AA weaponry that could reach those altitudes until the morning of the downing of MH27. On the other hand, Ukraine might have just assumed that Russia wouldn’t let the rebels do something as dumb as shooting down a civilian airplane. Kiev had also been downplaying how much of the country the rebels controlled, so it may have been reluctant to admit its airspace wasn’t safe. All just speculation though. Malaysian Airlines Flight MH17: What If Russia Wasn’t Involved? There is an increasing amount of evidence that Russia wasn’t necessarily directly involved in the tragedy.